Hello fans! El Bolso is back to share his thoughts on this weekend’s Clásico between Uruguayan powerhouses Nacional and Peñarol. Actually, I have just one thought to share: It’s time for the Uruguayan Federation to grow a set of balls and kick Peñarol out of the league, perhaps permanently. It’s time for the Manyas to take their triflin’ ways to a neighborhood league, where their fans’ behavior won’t seem out of line. It’s time to give them the bum’s rush. The teams came into this game living rather different circumstances. Nacional was in second place in the league table, tied with Wanderers one point behind leader Danubio; but they had a game in hand, meaning a win would leave them all alone atop of the standings with just 2 games left. A tie would give them a share of first place. The Tricolores came into the game having earned just 1 of their last 6 points, although that streak was matched by Danubio so no ground had been lost. Still, with the Franjeados settling for a tie in the Little Clásico against Defensor Sporting, Nacional was looking for a favorable result to take control of the league race. Peñarol, on the other hand, was having a disaster of a tournament. After several big name signings (well, for Uruguay) and the promotion of a batch of promising youngsters, the defending champions were all set to win successive titles for the first time since 1997 (yikes!). Instead, poor coaching and a lackluster start put them in an early hole. 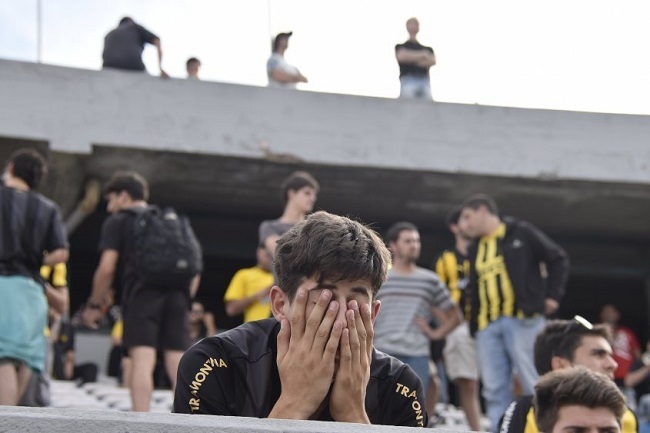 After a mid-season coaching change and a couple of wins in a row they seemed to be on the way back up, but on October 24th their game against Rampla Juniors was suspended just before halftime after shots were fired in a bathroom on the Peñarol side of the stands. As Rampla was winning 1-0 at the time, they were eventually declared the winner, although Peñarol escaped heavier sanctions. The team argued that the shooting was not sports-related and they could not be held accountable for the the behavior of criminals who just happened to be at the game supporting their players. AUF bought it, and the tournament continued, but the team was pretty much done. As derby day dawned, the Manyas were in 11th place, 15 points behind the league leaders. Their only hope for the rest of the season was to win this game and play spoilers to their traditional rivals. The game never happened. There were incidents outside the stadium prior to start time, and at some point the ticket sellers and security personnel on the Amsterdam side of the stadium had to leave their posts after being assaulted and robbed. Irate fans threw bottles, cans, and even a propane tank (I mean seriously) at the attendants. Whatever fans made it inside proceeded to riot, taking the place apart much like they did when the 2015 league final had to be suspended 8 minutes from time. Referee Leodan González consulted with police and private security and they told him the game couldn’t be played as long as there were fans in the Amsterdam stands, so he suspended it. We never even got as far as the opening kickoff. So what now? We’ll see. Everyone is staking out whatever ground is most convenient to their own interests: Peñarol, Danubio and Wanderers want the game to be replayed with empty stands. Some Manya bosses, like President Juan Pedro “Panama Papers” Damiani, think the tournament should be cancelled altogether, which I’m sure has nothing to do with the fact that their team is an embarrassment both on and off the field. Damiani himself told the press that he said months ago that this tournament was going to end up in violence and should never have been played. Nacional’s president thinks the tournament should continue, because to cancel it now would let the hooligans win, and he thinks Peñarol should just lose the points (of course). The league disciplinary board is set to meet on this as soon as possible, and AUF President Wilmar Valdez said no more games will be played until they reach a decision. It’s a mess. Frankly, I’m not going to tell you what I think should happen with the game. First of all, I am not an objective observer. Second, I think this goes deeper than one game and one tournament. Instead, I am calling for AUF to immediately suspend Peñarol from all league activities until such a time as they prove that they have taken steps to eliminate the clear and present danger their organized fan groups pose to anyone wanting to attend a league game. Look, I understand that hooligan violence is a reflection of bigger societal issues, and I get that Peñarol is not the only team with problem fans. My own Tricolores are wearing a pretty nasty black eye these days because of a shooting that took place during Peñarol’s latest birthday celebrations. But you can’t task soccer clubs with policing society at large. You can only hold them responsible for what happens during sporting activities, and in that area there’s a pretty large gulf between the organizational attitudes of Uruguay’s two biggest teams. Nacional has their own hooligan groups, but they’ve now spent over a decade working with the league and Uruguayan police to come up with ways to control them. Their private security force works hard to defuse tension in the stands. The club has taken a hard line policy on handing game tickets to hooligan groups. When incidents happen during games the club unequivocally condemns them and pays reparations when appropriate. No one is perfect, but Nacional’s leadership has chosen to confront the issue head on, because they see it as something that can destroy the club if left unchecked. Under Damiani’s leadership, Peñarol has taken a much more laissez faire approach. It is not uncommon for hooligan groups to storm the practice facilities to demand tickets and other concessions, or to straight up force the players into making “donations” when they get their paychecks. The Amsterdam has pretty much become a nest of thugs ready to go off at the slightest provocation. When something goes down, club leadership is primarily concerned with getting a favorable decision in league tribunals, so they hem and haw and issue memos about “societal violence” and how “all teams have this problem.” It’s a joke. Not all teams have finished dead last in a league tournament because their fans knifed a rival to death in front of his family. 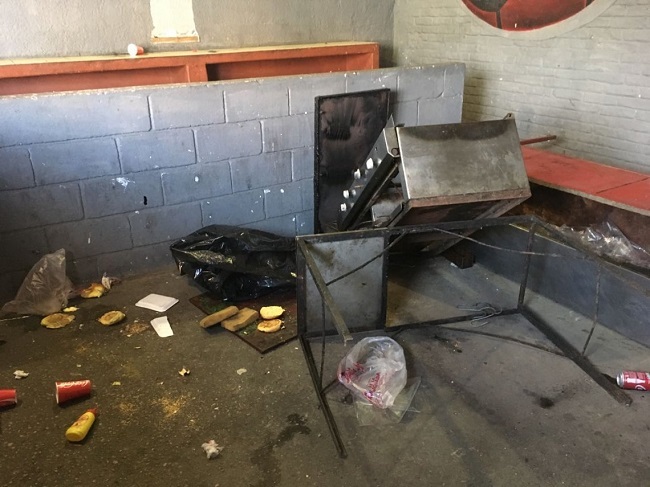 Not all teams have lost a game this season because of drug deals gone bad in their fan section’s bathrooms (see the link to the Rampla game above). Not all teams’ fans have caused 3 Clásicos to be suspended in the last 2 years (other than this weekend’s, there was the 2014-15 final playoff and a friendly in January of 2015) because of widespread rioting and assaults on stadium personnel. Sorry JP, we’re not all the same. Everyone has problems, but other teams are doing the equivalent of checking into rehab and re-evaluating their priorities, while Peñarol keeps driving home from the local bar after 8-10 beers. You have a problem, and you refuse to admit it, and that makes it a problem for the rest of us. And if AUF has any integrity left, they will stage an intervention that has been a good decade in the making. This is not about punishing Peñarol. This is about AUF sending a strong message: you either get with the program and help mitigate game day violence, or you’re gone. No ifs, ands, or buts. This is not a first time offender situation; we’ve been held hostage by Manya fans for several years now, and AUF has been complicit. Why is it that every season Nacional plays more true road games than Peñarol? 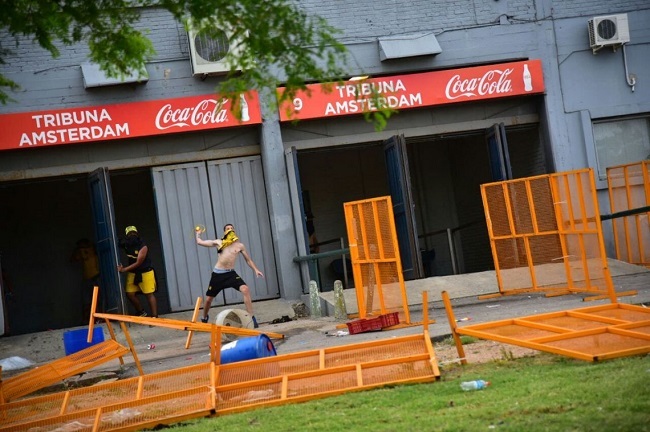 Because teams know they can bring Nacional into their stadiums and get away with it; no one (NO ONE) wants any part of the Amsterdam thugs, so those games usually get moved to the Centenario, where the league will pay for the inevitable repairs. 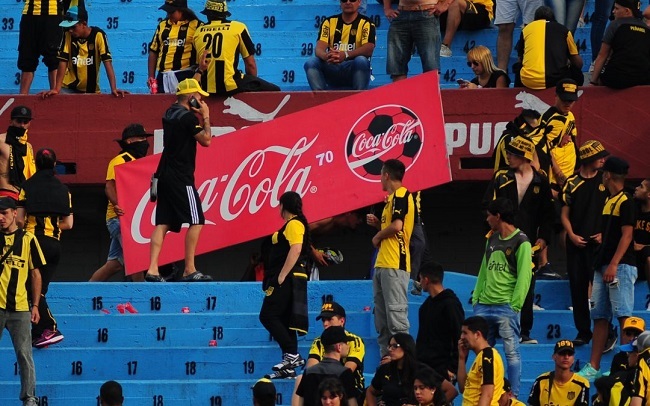 El Bolso thinks it’s time to put a stop to this: suspend Peñarol for the remainder of this season, and make their entry into the 2017 league contingent on the club taking concrete steps to control their fans. If you miss a payment on a player’s salary and can’t make good on it before the start of the next season, you don’t get to play. If you do that multiple times your team loses their league affiliation and has to start at the bottom of the league structure and work their way back to the top level. We will see two historically great clubs start doing just that next season: both Bella Vista and Jobu’s beloved Huracán Buceo are set to join the 3rd division 2017 tournament. However, if your team actively shields criminal enterprises masquerading as fan groups, and those groups assault stadium workers and take entire stands apart, you have to play a couple of games in empty arenas. Dafuq? How does that make any sense? El Bolso says, throw the bums out. Throwing propane tanks at ticket booths is no way to work out your anger issues. AUF needs to send the message that the league is done being used as a punching bag, and when you refuse to control your fans’ behavior there are real and immediate consequences. Please, AUF, dry that lonely tear making its way down Hank Hill’s cheek. Peñarol is a world-class soccer club, one of the most important clubs in the history of the sport; so were Juventus, Lazio and Fiorentina. Throw the bums out. They are one of 2 teams that matter in the league’s economic picture; so was Rangers FC. Throw the bums out. Hooliganism is a societal problem, one soccer authorities are powerless to control; they said the same thing in England. Throw the bums out. THROW. THE. BUMS. OUT. And get some damn cameras while you’re at it.